In June, Sister Sesarina Bau retired from St Vincent’s Hospital Sydney at the age of 84. It was an end of an era. 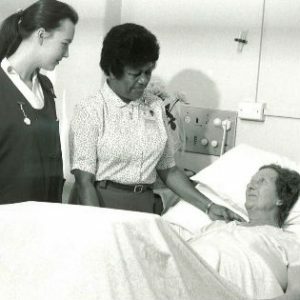 During the past 50 plus years, Sr Ses has worked tirelessly at St Vincent’s caring for everyone in many different roles. She has been the Supervisor of the Emergency Department, the Nursing Unit Manager of the Surgical Wards, Manager of Outpatients, Manager of the HIV/AIDS Ward and more recently a Patient Liaison Officer in the Intensive Care Unit and the Heart and Lung Clinic. On top of that, she made time to be a Trustee of the St Vincent’s Curran Foundation and helped guide their fundraising efforts. Sr Ses’ retirement marks the end of a long and distinguished career which was recognised earlier this year when, along with Sr Anthea Groves and Sr Jacinta Fong, she was awarded the Papal Honour, Croce pro Ecclesia et Pontifice. Sesarina Bau was a teenager, only 15, when she realised she had a vocation. 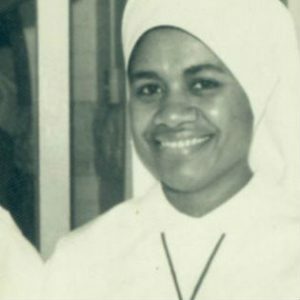 She knew she wanted to be free to care for people for God and so a few years later she went into the novitiate of her local Fijian order. Before long, the local Bishop asked some Sisters to go to Australia to study to become teachers, so Sr Ses studied, worked, and arrived at St Vincent’s College in Potts Point. After reflection and discernment, she felt her calling was pulling her towards nursing so she spoke to Sr Mary Sarto rsc and Sr Bernice Elphick rsc at St Vincent’s Hospital. It was agreed she would change her path from teaching to nursing. Since that Sr Ses, worked tirelessly at St Vincent’s caring. Her final role a St Vincent’s meant working with nursing staff to provide guidance to patients, families and staff when needed, especially in the Intensive Care Unit and the Heart and Lung Clinic. Research from various sources, including St Vincent’s Curran Foundation.